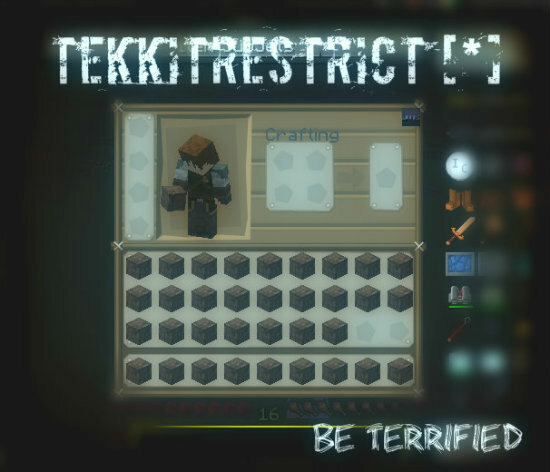 I love how Tekkitrestrict unloads chunks but from what i have noticed it doesnt always clear all the possible chunks. I have the max chunks set at 5,000 but iv noticed the ammount of chunks loaded likes to stick around 5000 and just below. Would it be possible to get a command to unload chunks even if it is not at the limit? The server keeps certain chunks loaded for reasons. Examples are spawn chunks, chunks loaded by chunkloaders, etcetera. It is not really possible for TekkitRestrict to see why a chunk is still loaded. It just checks if players are near, and if not, it tries to unload it. The chunk unloader just checks the amount of chunks and unloads some whenever there are too many. It just unloads the first chunks that it can find (where no player is near), which are probably the first ones loaded. I might add the command in a new Dev version, but I think it would be better if the command selected certain chunks for unloading, unloading the ones the furthest from players first, and not unloading ones kept loaded by chunkloaders. Tekkit, for some reason, does not properly unload chunks. As an example, when the server starts, the nether is loaded with about 300 chunks. When a player would go to the nether and leave the nether again, it somehow updates and unloads about 250 chunks, only keeping the nether spawn in memory. If no player goes to it, it will keep those 300 chunks loaded, basically wasting space. I understand that some chunks are kept loaded due to spawnpoint and chunk loaders but those are not the chunks i was talking about. All anchors are banned and i have considered the additional chunks for spawn yet sometimes i will have 3 players online with 3900 chunks loaded. I hope you decide to add the command in a new dev version as i feel it will be greatly helpful in the situations where it stops unloading just under the set ammount. (which for me is 4000) as of the moment i have to go into the config and manually lower the ammount in order for it to unload the rest then manually raise it back to normal. You can help decrease the amount of loaded chunks by decreasing view-distance in server.properties to a lower value. For some people, the chunkunloader apparently causes a lot of problems and even crashes. It might be better to turn it off. I have added the command in the new TekkitRestrict 1.22 Dev 1 version (available on the jenkins server, not yet checked by bukkit dev staff, use at your own risk). Current version does not unload chunks on command. Working on that.